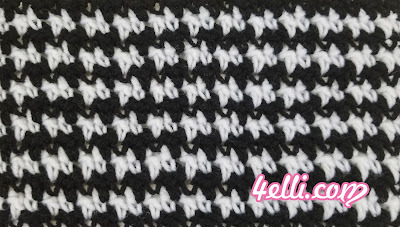 How to crochet the Houndstooth stitch!!! For this sample start with chain 27. Row 1: 1sc into the 2nd chain from hook, 1dc into the next, *1sc into the next, 1dc into the next* repeat from * to * across. Row 2: chain 1, turn, 1sc into the 1st, 1dc into the next, *1sc into the next, 1dc into the next*, repeat from * to * across.